On our trip to Campus Club Milledgeville we had the pleasure of attending their Black History Talent Show. 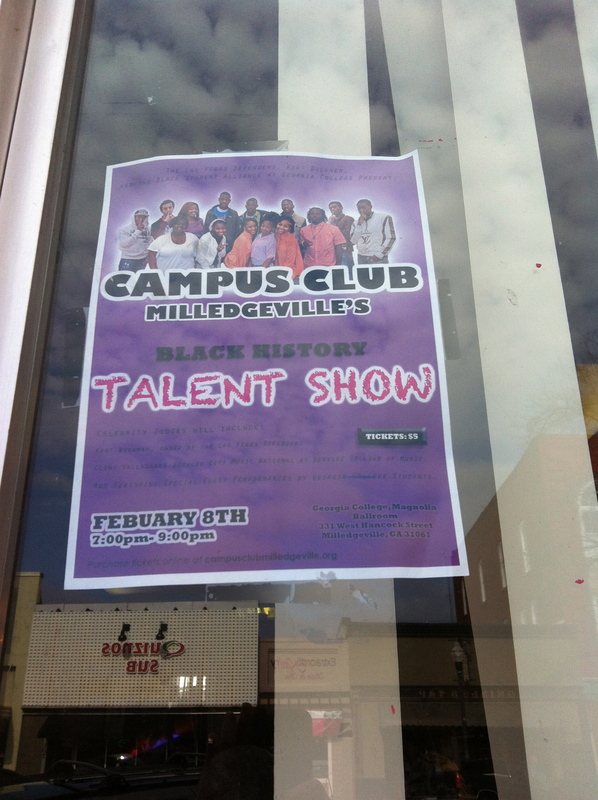 When we arrived and walked around town to meet Gregory Barnes, the Executive Director of Campus Club Milledgeville, we noticed posters for the Talent Show in almost every window or on most message boards. The word was definitely out because later that night the room was packed. The competition was tight with the winner receiving the prize of performing at a Las Vegas Defenders’ basketball game in Las Vegas, Nevada, sponsored by the head coach and president of the team Kent Buckner. The performers gave the judges a lot think about with vocal, poetic, and dance performances. Here are the list of performers. The dance group “Silence” with members Chris Jackson, Chris Guy, Voirsel Renfroe and Tommell Johnson won the talent show, and Ania Davis was the runner-up. For your enjoyment here are clips of their performances.